Mewtwo is a Legendary Psychic-type Pokémon debuting in Pokémon Red and Pokémon Blue Versions. Mewtwo was created artificially based on the genetic code of Mew to be the ultimate battling Pokémon, though it grew too vicious and powerful to be controlled and escaped. Among all the Pokémon that exist, Mewtwo has the most violent nature. As of Pokémon X and Pokémon Y, Mewtwo can Mega Evolve into either Mega Mewtwo X or Mega Mewtwo Y.
Mewtwo makes a playable appearance as an unlockable fighter in Super Smash Bros. Melee, and as a downloadable fighter in Super Smash Bros. for Nintendo 3DS / Wii U, later appearing in Super Smash Bros. Ultimate as an unlockable fighter, like in Melee. 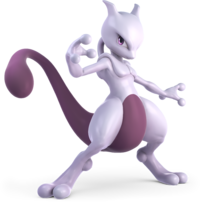 Its appearance in the Super Smash Bros. series is primarily based on the Mewtwo from the first Pokémon anime movie, which was cruel, condescending, and fierce, but also questioned its existence and purpose. Appears on-stage from a dark energy. Mewtwo was planned to be a playable character in Super Smash Bros., but time constraints posed as an issue, so it was left out. In Super Smash Bros. Melee, Mewtwo is an unlockable character. Mewtwo appears after the player has played a total of twenty hours of Melee matches with one player, fifteen hours with two players, ten hours with three players, and five hours with four players; alternatively, the player can play 700 Melee matches. Mewtwo must then be defeated on Final Destination to be unlocked. Mewtwo's moves are powerful and it can jump high, but it is a lightweight fighter, making it easier to launch, and it does not move as fast as other characters; while it has a high air speed, Mewtwo has a low fall speed and its running and walking speeds are low. Mewtwo also floats above the ground, making it an easy target to send flying and even KO at low damage percentages, and it also has low traction. Mewtwo also possesses a strong grab, and its throw moves pack a strong punch as well. Its standard special is Shadow Ball, which charges and fires a ball of dark energy. Its side special is Confusion, which flips opponents onto the ground and deflects projectiles (however, the reflected projectile does not damage opponents). Mewtwo's down special is Disable, which dazes any opponents that it is facing when using the move. Finally, its up special is Teleport, which causes Mewtwo to disappear and reappear in a different location. Mewtwo does not use its hands to hold items, using telekinetic powers instead, making the items hover before it. A similar style is seen when Mewtwo hangs on a cliff or grabs another character. The only time it does touch an item is when using the Parasol. Mewtwo is voiced by Masachika Ichimura in both English and Japanese. Mewtwo is one of the five characters who did not return in Super Smash Bros. Brawl as a playable character (the other four being Dr. Mario, Young Link, Pichu, and Roy). 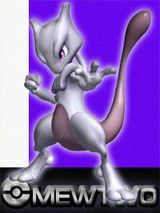 Data exists on the disc for Mewtwo as a playable character, however, meaning that at one point in development it may have been a character in the game. It does, however, have the appearance of a trophy, which can be obtained by completing All-Star Mode on Intense difficulty. Originally, Mewtwo only appeared as a collectible trophy in Super Smash Bros. for Nintendo 3DS and Super Smash Bros. for Wii U. Additionally, a Mega Mewtwo X & Y trophy appeared exclusively for Super Smash Bros. for Wii U. During the Super Smash Bros. for Wii U 50-Fact Extravaganza, however, Mewtwo was confirmed to appear as a downloadable fighter for Super Smash Bros. for Nintendo 3DS / Wii U. It is one of three cut characters from Super Smash Bros. Brawl to return, alongside Dr. Mario and Roy (the latter also appearing as a downloadable fighter). 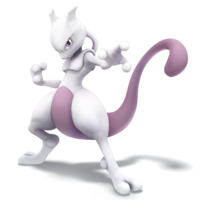 Mewtwo was released publicly as paid content at the Nintendo eShop on April 28, 2015, but players who had registered Super Smash Bros. for Nintendo 3DS and Super Smash Bros. for Wii U onto their Club Nintendo account before the end of March 31, 2015 received free download codes for Mewtwo on April 15, 2015. Mewtwo's design as a playable character in this game is closer to its current appearance, and it is now voiced by Keiji Fujiwara. While Mewtwo's moveset is identical to that of its Super Smash Bros. Melee incarnation, it has been given a Final Smash: Psystrike, in which it Mega Evolves into Mega Mewtwo Y and delivers a mental attack. Some of its other moves have also been altered to increase their effectiveness. Mewtwo is also much lighter (only being heavier than Jigglypuff), and moves faster than in Super Smash Bros. Melee, while keeping its attack power. Additionally, Mewtwo still offers one of the highest air speed attributes in the game, losing only to Yoshi and Jigglypuff, but its high air speed is offset by very low air acceleration, and its falling speed is above average as well. When Mewtwo is downloaded, it can appear in all the solo game modes, except for Events. In All-Star mode, Mewtwo appears between Diddy Kong and Pikachu. However, Mewtwo's inclusion has no effect on any of the challenges. Mewtwo reappears as an unlockable playable character in Super Smash Bros. Ultimate. Mewtwo's mobility is improved, while its double jump is made faster. Mewtwo's aerial attacks have less landing lag, while its short hop timing is reduced; Mewtwo's smash attacks knock opponents back farther, while some moves deal more damage. Several of Mewtwo's attacks receive names: its down tilt is Tail Sweep, its forward smash is Shadow Blast, its up smash is Galaxy Force, its down smash is Shadow Bomb, its standard aerial is Body Spark, its forward aerial is Shadow Scratch, its forward throw is Shadow Cannon, and its up throw is Psychic Whirlwind. (Ally: Cloud) Suzaku Castle Fight On! Shadow Ball is a Ghost-type move in the Pokémon series, and Mewtwo's standard special move. When used, Mewtwo stands in place and charges up a ball of dark energy; the charging deals electric damage in Super Smash Bros. Melee. 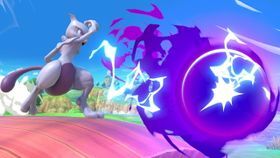 Unlike other auto-charging moves, Mewtwo continues to charge even when the move is fully charged; it can only be stopped by firing, shielding, or tilting the control stick to automatically roll. Charging the move allows it to travel farther and deal greater damage and knockback. When fired, the ball travels forward in a waving motion. 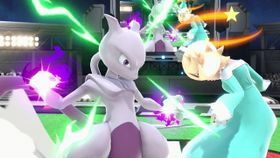 The move also has a recoil effect when fired which is greater when fired in the air, pushing Mewtwo back depending on how much the move was charged before firing. Mewtwo's forward throw also involves it firing Shadow Balls in rapid succession at opponents. Confusion is a Psychic-type move from the Pokémon series used as Mewtwo's side special move. When used, Mewtwo swipes its hand, causing a dark aura to appear around it, tossing opponents to the ground and damaging them if they are close enough. Confusion can also deflect projectiles, though in Super Smash Bros. Melee, deflected projectiles cannot damage the original user, but in Super Smash Bros. for Nintendo 3DS / Wii U, all projectiles deal damage when reflected. When used in the air, Mewtwo does a slight hop. The move can also bypass opponents' shields. Teleport is a recurring Psychic-type move appearing in every installment of the main Pokémon series, and appears as Mewtwo's up special move. Mewtwo disappears in a flash of light, and reappears depending on the direction the player holds on the control stick, similar to Zelda's Farore's Wind. Like any other up special attacks, Mewtwo is left in a helpless state if it is in the air after using Teleport. Disable is Mewtwo's down special move, based upon the recurring Normal-type move from the Pokémon series. Mewtwo fires a beam from its eyes in the direction that it is facing, temporarily dazing any nearby opponents caught by it and damaging them; the opponent must be facing Mewtwo and at around its eye level for the move to work, however. The move also dazes opponents for longer if they have a higher damage percentage. In Super Smash Bros. Melee using Disable on an already dazed opponent causes them to fly off, though in Super Smash Bros. for Nintendo 3DS / Wii U this only deals more damage. If the move is used on an opponent in the air, then they will only briefly flinch. 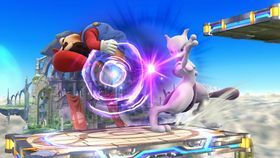 In Super Smash Bros. for Nintendo 3DS / Wii U, Mewtwo's stance when using Disable is different than in Super Smash Bros. Melee, with its lower head position allowing the move to hit smaller opponents more easily. Psystrike is Mewtwo's Final Smash. In the Pokémon series, it is a Psychic-type move learned by Mewtwo at level 100, and is Mewtwo's signature move as of Generation V. When activated, Mewtwo Mega Evolves into Mega Mewtwo Y, then fires a large ball of psychic energy across the screen in the direction Mewtwo is facing, stunning any opponents in its path. The stunned opponents then take heavy damage and are launched away as Mewtwo returns to normal. Opponents can be stunned even if they are in the air. Mewtwo is one of the Costume Mario costumes that can be unlocked in Super Mario Maker, either with a Mewtwo amiibo or as a random unlock by completing the 100 Mario Challenge. Mewtwo's sprite is based on its overworld sprite from the Nintendo DS Pokémon games, though like the other Pokémon costumes in the game (excluding the Event Course costumes), Mewtwo does not have any unique sound effects, instead using the default Super Mario Bros. sounds. 9/98 A genetically created Pokémon, Mewtwo is the result of many long years of research by a solitary scientist. Although Mewtwo was cloned from the genes of the legendary Pokémon Mew, its size and character are far different than its ancestor. Its battle abilities have been radically heightened, making it ruthless. GB Pokémon Red & Blue A Genetic Pokémon. This legendary Pokémon was based on a recombination of Mew's DNA, created by a scientist after years of research. However, Mewtwo greatly differs from Mew in both size and personality and is said to be the most twisted and savage Pokémon ever. Mewtwo has incredibly high combat abilities and uses Psychic-type attacks. GBA Pokémon FireRed & Pokémon LeafGreen (09/2004) Created from modified Mew DNA, Mewtwo was designed to be the ultimate Pokémon. It didn't take on any of Mew's kinder traits and only uses its intelligence to destroy its enemies. Or...so it seems. Perhaps it just feels frightened or even tormented, and that's why it lashes out. Whatever the reason, Mewtwo is not to be messed with. N/A 3DS Pokémon X & Pokémon Y (10/2013) It's almost no surprise that a Pokémon as powerful as Mewtwo wouldn't be limited to a single Mega Evolution. Mega Mewtwo X has strong arms and legs, while Mega Mewtwo Y has a whiplike, slender head. The differences aren't just physical - X brings improved fighting power, while Y can unleash even more psychic power. Mega Mewtwo comes in two forms rather than just one. Mega Mewtwo X has visibly strengthened limbs, which greatly boost its physical abilities in battle. Mega Mewtwo Y, on the other hand, has a whip-like tendril extending from the back of its head, which augments its psychic powers. 3DS Pokémon X & Pokémon Y (10/2013) Mewtwo puts its psychic powers to great use in this game. Not only does it have floaty jumps, but its telekinesis gives its attacks extra reach and its throws added power. However, its light body makes it easy to launch, so if you're willing to risk getting in close, it might just be worth it! Mewtwo puts its psychic powers to great use in this game. Not only can it float in midair, but its telekinesis gives its attacks extra reach and its throws added power. However, its light body makes it easy to launch, so if you're willing to take the risk of getting in close, it might just be worth it! 3DS Pokémon X & Pokémon Y (10/2013) Mewtwo's Confusion side special not only lets you repel projectiles–it also reflects the damage back on your opponent. Its down special, Disable, stuns an enemy for longer the higher its damage is. As it works by having Mewtwo glaring at its foe, this only works if they make eye contact. 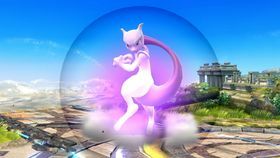 Mewtwo's Confusion side special not only lets you repel projectiles–it also reflects the damage back on your opponent. Its down special, Disable, stuns an enemy for longer the higher its damage is. As it works by having Mewtwo glaring at its foe, this only works if they make eye contact. Mewtwo's Confusion side special not only repels projectiles–it also reflects the damage back on your opponent. Its down special, Disable, stuns an enemy for longer the higher its damage is. Disable only works on foes that are facing Mewtwo. N/A Mewtwo's Final Smash starts as Mewtwo Mega Evolves into Mega Mewtwo Y. It then fires a huge psychic projectile that penetrates enemies and obstacles. This projectile doesn't do any damage, but it freezes every foe it hits in place. They can even be frozen midjump! Afterward, every foe hit with the projectile will take a powerful psychic hit to the head. The following dialogue also applies to Lucas, Roy, Ryu, Cloud, Corrin, and Bayonetta; all DLC characters, like Mewtwo. Myūtsū ミュウ (Myū) is the Japanese name of Mew and "tsū" is the Japanese pronunciation of "two". Chāomèng "Super Mew". 夢夢 (Muhngmuhng) is Mew's Cantonese Chinese name and means "two dreams". Mewtwo never speaks: when the language is set to English in the NTSC version of Melee, at all in the PAL version of Melee, in Western versions of 3DS/Wii U, and when the game is set to any language other than Japanese or Chinese in Ultimate; it makes only grunts, laughs, and other noises. However, it does speak telepathically on the results screen when the language is set to Japanese (as well as Chinese in Ultimate). When in metal form in Super Smash Bros. Melee, Mewtwo does not make clanking noises, even when it lands; in Super Smash Bros. for Nintendo 3DS / Wii U, while it still does not clank while moving, it does when it lands. The tagline for Mewtwo's Super Smash Bros. for Nintendo 3DS / Wii U trailer, "Mewtwo Strikes Back! ", is a reference to the name of the first Pokémon movie. Mewtwo's depiction as a lightweight fighter in the Super Smash Bros. series is likely due to its floaty attributes and its tendency to float while moving, which are both mentioned in its trophy descriptions. Its lightweight status may also be a reference to the Pokémon games, where its defenses are on the low side when compared to most other Pokémon who share its base stat total. Mewtwo is thus far the only Legendary Pokémon to be playable in the Super Smash Bros. series. ↑ Wii U - Super Smash Bros. for Wii U 50-Fact Extravaganza. Posted to YouTube by Nintendo (October 23, 2014). Retrieved October 23, 2014. This page was last edited on March 31, 2019, at 11:21.